The Bullmastiff is a massive dog! It is a cross between the Boxer and Mastiff; hence its name! It is a large dog and not that common in the United States. Outside of being a fine family pet, the breed is used by law enforcement agencies. The breed is a gentle dog but bigger than a lot of people. They can easily jump and knock a human down pinning the individual to the ground. An excellent guard dog. They require a lot of exercise to be happy so one would not want to raise this breed in an apartment setting. 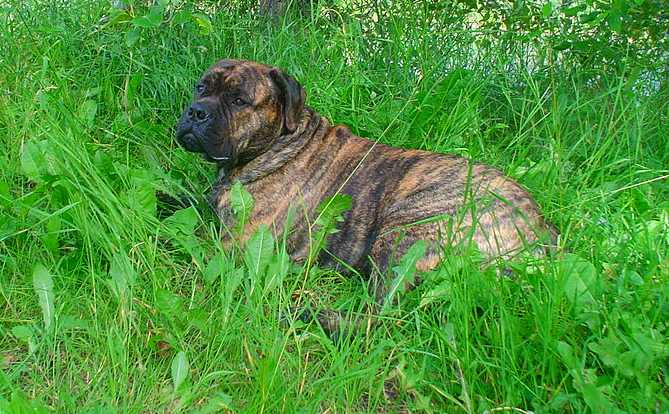 There are no particular medical issues that are associated with the Bullmastiff. Remember that a large percentage of giant breeds are prone to bone cancers and gastric torsion. With their short hair-coat, they are easy to care for but require lots of food and exercise to thrive. Just be careful on feeding the female after being spayed. The overweight spayed female can have an earlier onset of hip issues if left obese. Like all large breeds of dogs, the Bullmastiff should enter obedience training as soon as possible! Learn more about the Bullmastiff at Animal Planet’s Dog Breed Selector.